Throws Like A Girl , who is part of our group at Mothers With Cancer, suggested that we need "a prosthesis relocation program." We are off to the maritimes tomorrow (if all goes well-it's a two-day drive with two kids and two dogs). I may be offline until August 12. I feel the withdrawal pangs starting already. A non-virtual connection with Melissa from Stirrup Queens (and author of "Navigating the Land of If"). We are both holding Nora's head on a stick. 1. If Twitter was played a role at last year's BlogHer conference, this year it was front and centre. "if you are an engaged parent you have less to worry about in terms of sexual predation online" #blogher09 session on online kids. it never occurred to me to worry about kids taking pics at my son's sleepover b-day party. should i have? #blogher09 kids online session. "we are tethering our kids" "we are raising our kids in captivity" - this is the way times have changed. #blogher09. 2. In the closing keynote, the subject came around again, to Twitter. One commenter likened her Twitter community to a support group "I think the women I've met online in the pregnancy loss community have saved my life" (I didn't get her name or blog. Let me know if you did). A powerful statement, but I can relate. She went on to say that support groups are not available 24/7 the way that an online community can be. 3. One of the speakers also observed that most people get started blogging because of someone they know in their "physical life." I thought that was interesting, because it was my spouse (a non-blogger) who introduced me to the blogosphere. 4. Another favourite keynote comment (again, if you know who said this, do let me know): "People with higher levels of income tend to be online. We need to be vigilant that our online communities are not recreating or reinforcing existing inequities." 5. As you can see, I found the content to be very rich and thought provoking this year, despite the size of the conference. 6. I do worry that some people spent so much time tweeting that they missed connections with real people or taking in the discussions occurring around them. 7. One of my favourite Twitter moments occurred when "phdinparenting" lamented her dislike for American beer. She posted about our interaction on BlogHer. It really tickled me that I could be of help. There were lots of those kinds of tweets, throughout the conference. 8. I wish the bookstore had been in a different location. One person suggested in a conference feedback thread that the bookstore would do better closer to registration. I suggested that book signings take place during cocktail parties, in the middle of the action (and of course it wouldn't hurt if free cocktails made people want to buy more books). The conference organizers have acknowledged that the placement of the bookstore in the far corner of the Expo hall was a mistake (too far out of the way. And who wants to buy a book when they are surrounded by mounds of free stuff?). While I do understand how experiments can fail (and how it must have seemed like a good idea during planning) I just wish that this particular year (when I schlepped a bunch of books in my suitcase) had not been the one where the bookstore flopped. 9. 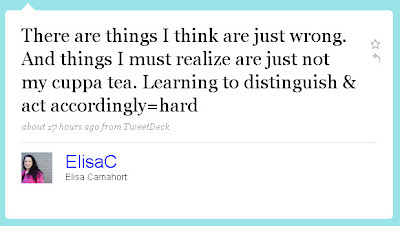 Elisa from BlogHer made an observation (in a tweet, of course), that she is trying to learn the distinction between things that are "wrong" and things that are just not her "cuppa tea." That's how I feel about the karaoke during the Friday night cocktail party. I hated it. However, others seemed to be having fun (perhaps I am just getting old), so I got myself a hot date and went to find a patio. 10. I have other thoughts but Sassymonkey and Blondie expressed them already. Go read their posts. I said many times before going that BlogHer09 would be my last. I hadn't even unpacked my suitcase before I'd begun to fantasize about getting to BlogHer10 in NYC. Anyone want to drive down from Ottawa and share a hotel room with me? I am having my best BlogHer ever. The biggest difference is that I am more comfortable in my own skin, more at ease with who I am and more willing to take risks when it comes to approaching people. I also know myself well and am making the choices that are the right ones for me. This has meant that I am not pressuring myself to "network" not doing the parties and welcoming opportunities for one on one time with interesting people. This has led to the creation of some lovely memories and the deepening of some friendships. Yesterday, I attended sessions on "The Transformational Power of Blogging," "Blogs and Body Image: What are we teaching our kids?" and "Patient Bloggers: You are not your disease - you just blog about it every day." Every one was excellent. I toyed with the idea of skipping the "Community Keynote" but I'm so glad I didn't. A series of bloggers read selected posts from their blogs, each more funny or sad or powerful than the next. And some really beautiful pieces of writing. Last night's cocktail party was a little grim (karaoke! ouch!) or maybe I am just getting old ("the noise! I couldn't have a conversation!") The free booze just wasn't enough to make me stay. Luckily, I invited Elana to have dinner with me - and she said yes. A pint and a bite and some lovely conversation later, I felt restored. Today, I have visited the vendors, talked to people and, at lunch, I did my book signing. They had us tucked away in a far corner of the Expo hall, so it was a little slow. I was signing with Ilene Chaiken, creator of the L-Word and we still didn't draw more than a handful of people. I've sold and signed a few books, though and have done as well as anyone else here. Next up is a session on "Online Safety for Your Kids Who Are Online Themselves." I just hope it's not all scaremongering. I think I'm going to skip the evening cocktail party and go have some deep-dish pizza with Suzanne, her parents and some other bloggers. 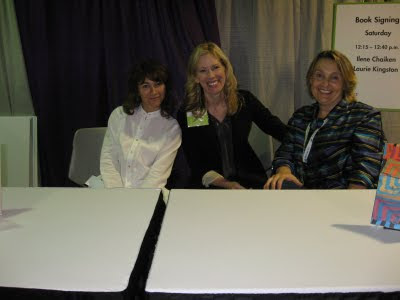 This time, I wasn't to oshy to ask for a celebrity photo (that's Ilene Chaiken on the left and BlogHer co-founder - and blurber of my book - Lisa Stone in the centre). What I mean is, that I am now in Chicago, comfortably ensconced in my hotel room and ready to attend BlogHer 09. I didn't get sick (although both my kids did) or my symptoms were really mild (or I have yet to be felled but I won't consider that option). Thanks to everyone who wished me well. I think it helped. I am typing this (badly) on a lovely little borrowed Netbook, since my computer died on Tuesday afternoon. After calling around for the best prognosis and cheapest care, it seems like it's fixable. I'm glad but I could learn to love this little loaner, even as I adjust to a new keyboard. Last year, you may recall that my computer took sick right before BlogHer as well. I chose to be computer-less (and while I certainly didn't mind not schlepping the thing back and forth from Oakland to San Francisco and back every day, I did miss being wired. Twitter played such a big role at last year's conference (I'm @lauriek. Follow me, if you like!) and I missed being able to read everyone's comments at day's end and add my own. Also, the comprehensive agenda was online only and I left before it was available, so that was a bit of a hassle. This year's laptop demise may end up feeling serendipitous. I'm not going to hide behind the computer, though. I made myself some handwritten notes this morning (I try to spend a few minutes writing free-hand most days) which can be summed up this way: relax, don't let my introversion get the best of me and have fun! I forgot my USB cable (so no photos to download until I get home) and a little gift to exchange with someone. I did remember to bring a friend's husband's forgotten wedding ring and another friend's head on a stick. The head (well, photograph of a head) belongs to Nora who can't be here (something about having given birth to twins). Nora and I met at last year's BlogHer. I liked her very much. And I must say that she has thus far been an excellent travelling companion. There are a few of us here bearing Nora's head and tomorrow, we are going to try and pose for a group photo. I have to head over to the conference hotel, shortly (I am staying a few blocks away) and deliver my books the bookstore. I'm doing a signing on Saturday at lunch (12:15 to 12:40). I 'm sharing the spot with Ilene Chaiken (creator of the L-Word), so I will either benefit from her spillover or be left entirely alone. 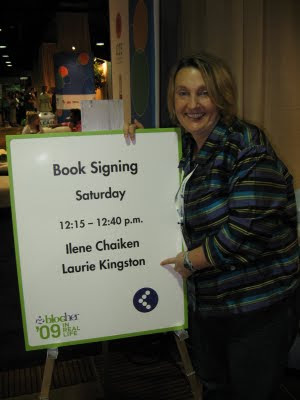 If you don't yet have my book and you want to buy it at BlogHer, I promise to sign it and write something really nice. We got back yesterday evening from my spouse's family cottage. It's a place I love and where I am always happy, even when the weather does not cooperate. So despite the fact that I couldn't bring myself to go swimming and I didn't sit around on the dock in my bathing suit, I still found time to read, enjoy the company of family and make art with D. ("Who would have thought that painting could be so much fun?" he said. "Using your imagination! "), knit, go for walks, eat and drink too much and just relax. My spouse taught S. how to play Backgammon and D. taught me how to tolerate playing PayDay. It was all quite lovely, even if we we did miss the sun. On the very last night, though, D. woke with a fever and could not get back to sleep. He threw up twice (and copiously) on our long drive home. I kept him home today and let him watch DVDs in his pajamas. By this evening, he was asking to go to the park. Through it all, I comforted, fussed and nursed. And tried not to heed the guilty voice in my head: "The kid has lousy timing! I can't get sick. 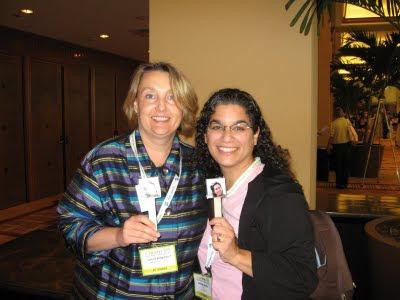 I leave on Thursday for BlogHer!" I cannot get sick. I will not get sick. I am going to bed and tomorrow, I will wake up feeling well. Cross your fingers for me, OK? *temporarily ill-fated. Re-scheduled for October. I am off to a place with no internet and no phone (hard to believe but it's true. Our cell phones don't even work there). It's also one of my favourite places in the world. I'll be back in a week or so. Don't let me forget to tell you the story of how my prosthesis found a new home (and all the good help and advice - both humorous and helpful- that I got from my online community). She was known as Sepha and her blog was Undone. 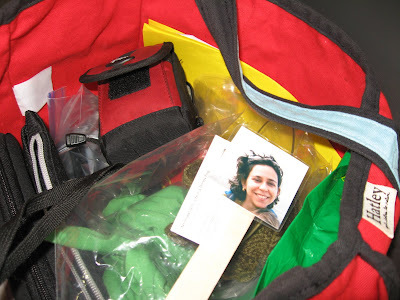 I have been meaning to email her, send her a package, comment on her blog. I have been thinking of her lots. Now we have lost another one. Another smart, funny, creative woman has succumbed far too young to cancer. Life, sometimes is so unfair. And damn, I wish I had sent that package. My heart goes out to her family and her Dear Other. It's not the kind of thing I'd want to advertise on Craigslist or Kijiji. I can't set it out on my front lawn and hope someone takes it away. I doubt the Canadian Diabetes Association or the Ontario Federation for Cerebral Palsy would want it as part of their drive to collect use goods for re-sale. But I have a perfectly good prosthesis, worn only a handful of times that I'm sure someone could use, even if it was wrong for me (and I have replaced it with another one I don't seem to be wearing much). The government covers about two thirds of the cost of a new prosthesis. That balance must be prohibitive for many who don't have private insurance to take care of the rest. How do I find someone who can use it though? Maybe someone at Breast Cancer Action would know. Of course, I could always use my prosthesis to make art, the way Jacqueline did. I think my inclinations might be a little more violent, though. Because every Canadian finds a Mountie on their front lawn on Canada Day. The food was good, the beer was cold and their was maple syrup in the salad dressing. Now the dogs are being driven crazy by the fireworks. Do you know hard it is to keep track of two six year olds in a museum on Canada Day, when admission is free and everyone is dressed in red and white? So far today I have been to the Museum of Civilization, eaten Vietnamese noodle soup, watched two boys play in a splash pad at a park and taken the dogs for a walk in the rain. Now that the sun is out, I'm going to join friends on their back deck, watch the kids splash in the pool, eat some barbecued stuff and have a beer or two.